Substantial portions and well-prepared rustic Italian food in Cleveland Park. : Cleveland Park’s classy Dino offers a neighborhood destination for topnotch, though slightly pricy, rustic Northern Italian specialties: this is no spaghetti-and-meatball eatery. (Nor does its name suggest a return of the Rat Pack.) Indeed, there is an effort to source local ingredients, to pair good wines with entrées, and to offer traditional dishes to please the American palate. 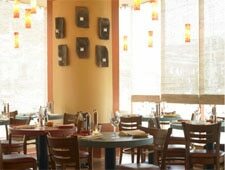 For starters, your selections include both warm and cold salads---we recommend the grilled seasonal veggies---and the typical pasta course and a small selection of rather dear Tuscan-style grilled meats. Best bets? The papardelle with wild boar and the lemon-scented roasted half chicken with greens. Desserts include gelati, tiramisu and a warm chocolate cake, but the wise patron will scan the extensive cheese selection instead for the finishing touch. Also ask about the wines, and drop in for the Wine Wednesday gatherings.